Peel the asparagus. (Don’t peel its head though, as this is the best part of the asparagus!) Blanch the stalks in some boiling water for approx. 4 min. Deseed the vanilla bean. Finely chop the sun-dried tomatoes and almonds, then sauté in a frying pan with some olive oil. Quarter the cherry tomatoes, then add to the frying pan. Season with salt, pepper, and the vanilla beans. Add some fresh chopped parsley and remove from the heat. Fry asparagus in a separate frying pan until golden. Finely slice the green part of the scallion. 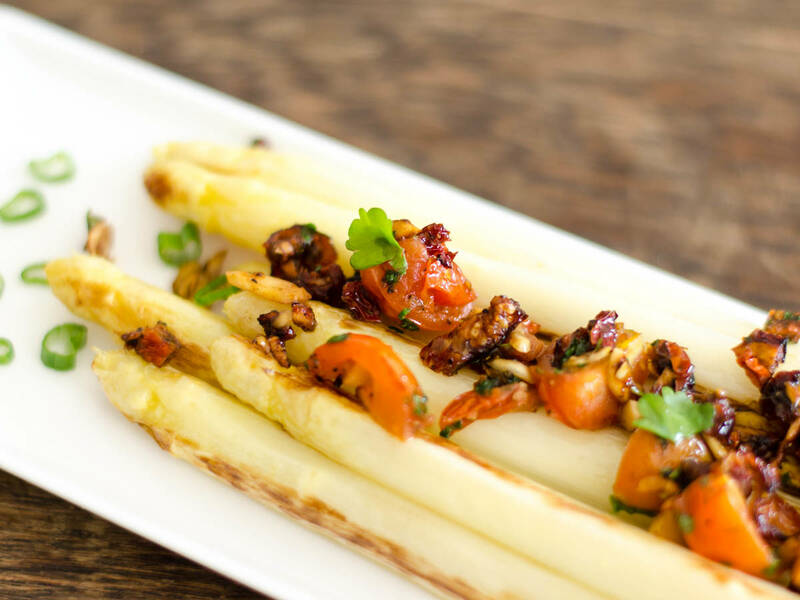 Plate the asparagus, top with the tomato mixture, and garnish with scallion rings. Enjoy!